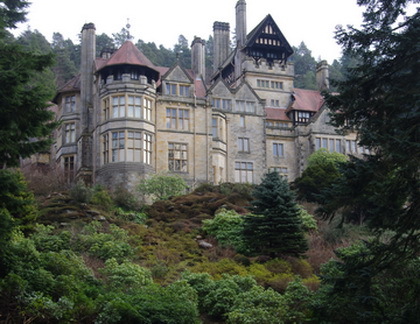 Dallying In The Dirt, Issue #255--- Cragside is the final stop before returning to snow. In other places, good things are happening. The Witch Hazel remains in full colourful bloom. It’s been at least 4 weeks now, much longer than other years, and it’s still a delight. There are many Crocus trying hard to put on a show and everywhere the Tulips are showing significant growth. A few of them have some burnt or damaged leaf tips but that shouldn’t have any effect on their blooming. Down in the basement the dozens of seeds I planted before we left have mostly germinated and are hinting of a few hours of transplanting in the near future. I always try to wait until the first pair of true leaves has developed, that seems to create a better success rate. Spring continues in some form despite the weather. Cragside is just a little place in the country that we visited on the day we left England. Here, in front of the house, it boasts one of the largest rock gardens and I can attest that it certainly is one of the steepest. There wasn’t much to admire this early in the season but the thousands of buds on the Azaleas and Rhododendrons made me want to return in a few weeks. Because of its size, such shrubs predominated rather than the sedums and similar that we might find at home. There was also large cascades of Heather and Daphne that were showing great promise. A long and winding waterfall trickled down through the whole thing. That magnificent house at the top was built around the 1860s and was a testament to the engineering expertise of its owner, Lord Armstrong. We stood in the room that was the first to be illuminated by electric light bulbs and they were powered by the river that runs through the property. The formal garden, a hearty 15 minute walk away, had many of the original greenhouses still yielding the grapes and figs and citrus that they would have, when they supported the kitchen in the main house. The Pinetum had hundreds of massive evergreens that have been growing there since those early days. Douglas Fir that were imported from western North America, rivaled their native cousins in size. It was a fitting end to a great trip and we left the granddaughters in Cragside’s large playground as we headed to the airport. The great space shuffle has started well. That’s space under my lights and in the propagating chamber. The large Geraniums that were awaiting my return have been transplanted into deeper pots. I was quite surprised at how little root growth they showed for the size of the plants. They are now happily in the heated coldframe and should show some noticeable growth with the increased light and day time heat. 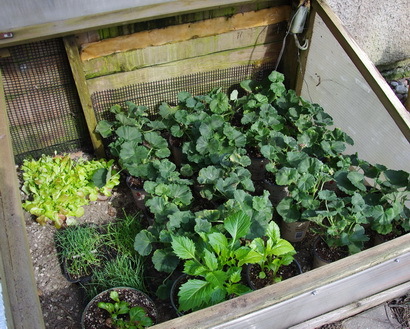 It is about + 5 C outside today but I had to open the cold frame slightly as it was +28 C inside with the sun shining on it. The trick is to remember to go out and close it soon as the sun starts to drop. As well as having the heating cable in the floor, it’s a good idea to trap and retain as much of that warm air as possible. 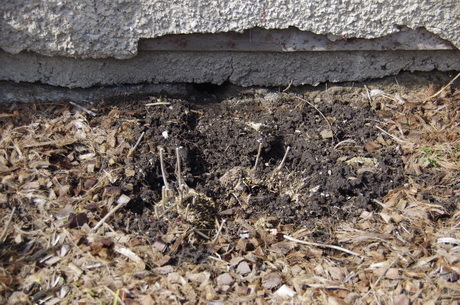 The other occupants of that space are all of the Onions that are waiting for some warm soil in the garden and the first Dahlia tubers that are sprouting. There is also a container of Mesclun mix that is almost big enough to cut for our first fresh salad of the season. The rest of the plants in the basement have been shuffled around to make use of the vacated space and several more varieties of Tomatoes have been seeded along with some more Lettuce and herbs. It’s an ongoing cycle that is designed to get the maximum usage from the available space and to get the early vegetables into the garden as soon as that soil is dry enough to work with. Bonnie Asks? I recently purchased a used portable in home greenhouse, with a zip-off clear plastic cover. It's 3-tier and has growlights on each level and a timer. My question is, when I start some of my flower seed's, Malva, Lavatera, and Zinnia, do I leave the lights on all the time..part of the time, a few hour's a day? The greenhouse is currently in my laundry room, so only get's diffused light from two casement window's during the day. Do I pinch the seedling' s back to keep them bushy? This is a new foray for me. I've tried planting seed's directly into the soil after the last frost with limited success. Usually lose most of them to squirrels or heavy rains. Ken Answers! The usual rule is lights on for 16 hrs and off for 8. Most of the annual flowers you mention will branch and become bushy in their own. Linda Asks? I have noticed the last couple of years that my daffodils have a fair amount of stems, but only a handful of blooms. They were given to me quite a few years ago by someone who was dividing her supply. I dug a few up last year thinking that maybe they were over crowded. I do let them totally die back to feed the bulb. Is there something else I should be doing to them. I thought they multiplied every year, but mine don't seem to be producing many blooms like I see in some yards. What do you suggest? Ken Answers! The thousands of roadside Daffodils in the picture probably never get divided or fertilized or much of any attention and they obviously thrive. I don't think we can duplicate the English climate so I'm not really sure what to suggest. My best clumps just get ignored from year to year. Are they in shade or sun as more sun might help the bulbs develop or possibly some low Nitrogen fertilizer. Vivian Asks? What should I do with my geraniums? I took cuttings last fall and easily rooted my geraniums in glass jars and repotted them when the root systems were developed. They have been down my basement under fluorescent lights all winter growing beautifully. They are now one foot tall and thriving with lots of new growth. So with more time still left before they can be hardened off and placed in my mini greenhouses in my sidedrive, can I chop the tops off and root them? I just don't want to plant 20 foot geraniums in my garden later. How can I slow down their growth.....or can I chop and propagate more???? Ken Answers! Chop and propagate. More plants and the old ones will branch out and be bushier. Chop them about 1/2 way back to get branching nearer the bottom and then root the top 2-3" of the piece you cut off.